Stradford set a school career rushing record with 3504 yards at Boston College and scored 36 touchdowns. He was chosen by the Dolphins in the fourth round of the 1987 NFL draft. A classic scatback who was fast and elusive, Stradford beat out Lorenzo Hampton for a spot in the starting lineup. Dolphins went 8-7 to finish third in the AFC East in the strike-shortened season (three games were played with replacement players) while leading the NFL in passing yards (3876) and the conference in touchdowns (47, tied with the Cleveland Browns). 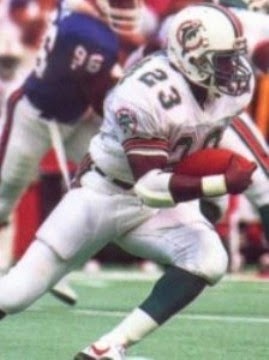 After setting a franchise record for yards from scrimmage by a rookie, Stradford suffered through an injury-plagued 1988 season and his rushing output dropped to 335 yards, although he caught 56 passes for 426 yards. A major knee injury limited him to seven games and 473 yards from scrimmage in ’89 and, following a lesser season in 1990, he signed with Kansas City as a Plan B free agent in 1991. The Chiefs used him almost exclusively as a kick returner with unspectacular results as he averaged 6.8 yards on 22 punt returns and 20.9 running back kickoffs in a season in which he missed the first few weeks due to a broken arm. Waived during the ’92 preseason, Stradford was picked up by the Rams and also played for Detroit in what was his last NFL season. He played for the Amsterdam Admirals of the WLAF in 1995 with modest results. Overall, Stradford rushed for 1380 yards on 356 carries (3.9 avg.) and caught 170 passes for 1479 yards (8.7 avg. ), scoring a total of 12 touchdowns.